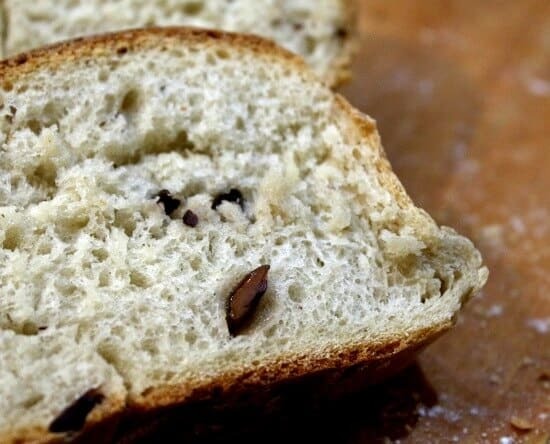 This onion cheese yeast bread recipe makes a loaf that is perfect for grilled cheese sandwiches. 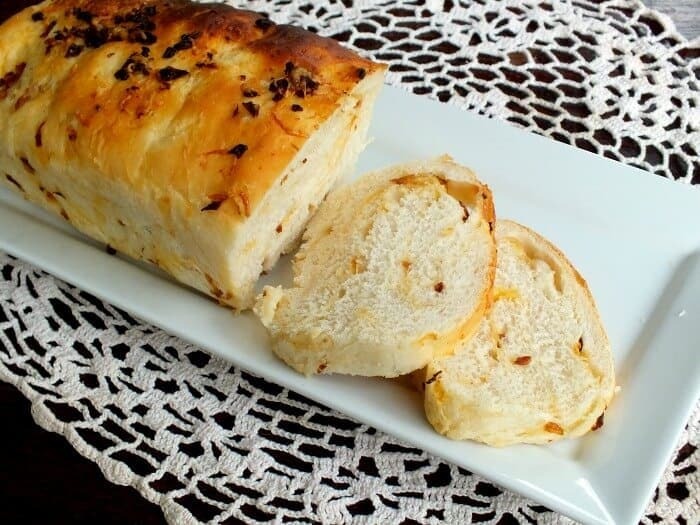 Soft bread has caramelized onions and pieces of sharp cheddar cheese. It’s delicious toasted, too! 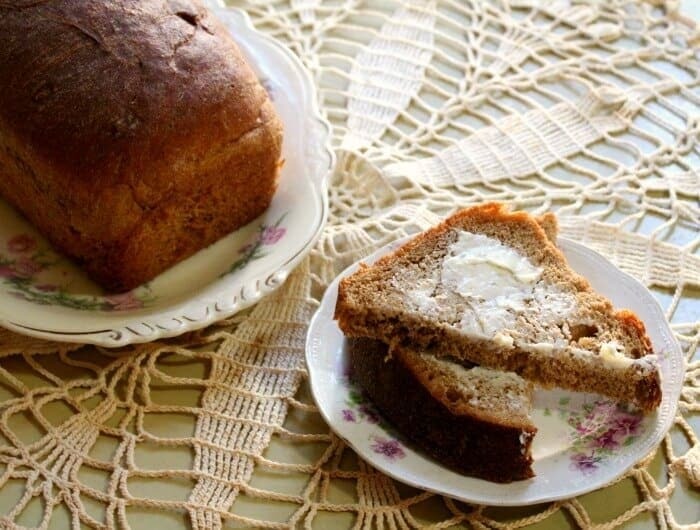 Although making homemade bread requires a little time the results are worth it! You might want to brush up on your bread baking skills with these tips, first. Onions are easy to caramelize and doing that gives them a deeper, richer flavor. You just need to chop them, melt some butter in a sauce pan, and simmer them in the butter covered until they turn a nice, rich brown, and get soft. Be sure to let them cool to room temperature before you go on with the recipe. Too much heat will kill the yeast. The sharper the cheese that you use the better the flavor of the bread. 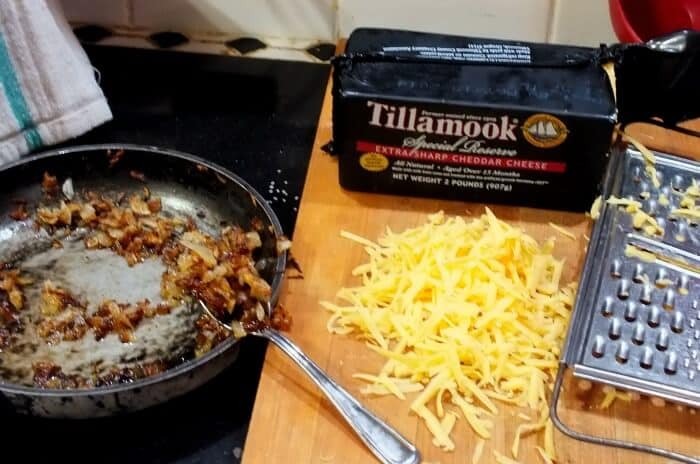 I like to use Tillamook’s special edition cheddar but use what you like best. Be sure the onions have completely cooled to room temperature before adding them to the dough. You can make this in a free form shape – oblong or round. Using a good mixer to knead this onion cheese yeast bread will help the loaf rise light and fluffy but you can knead it by hand as well. If you’re having trouble with the kneading part be sure to watch this video about kneading bread by hand. Roast Beef Sandwiches on Onion Bread? Yes Please! When I was a kid we had a pool and in the summer my parents threw pool parties. One of their friends used to bring shaved roast beef sandwiches on onion bread and I swear I could eat those things until my stomach bloated and I didn’t have enough room to swallow a teaspoon of crushed ice. There is something about the combined flavor of onion and cheddar in this slightly tangy buttermilk bread that is off the hook good. I love it toasted because it brings out the flavor the most. I can eat it with butter and nothing else, in sandwiches or with a good bowl of potato soup. Once it gets sliced it disappears pretty fast but you can double this recipe and freeze the extra. I love to make bread. I have making making yeast breads since I was 14 and I am now 53 – do the math! For years I kneaded it by hand but several years ago I bought a K-Tec. I used it for a long time but the newer design is not as good as the old one so I switched to Bosch Universal Kitchen Machine. Yes, they are pricey but I can make 6 loaves of bread at once and it is super easy. If you can pick one up on eBay the cost isn’t so bad. Good luck! I use a Bosch Universal Plus Mixer because it makes it so easy to throw bread together. I don’t like the way it whips egg whites but for anything else? It rocks! 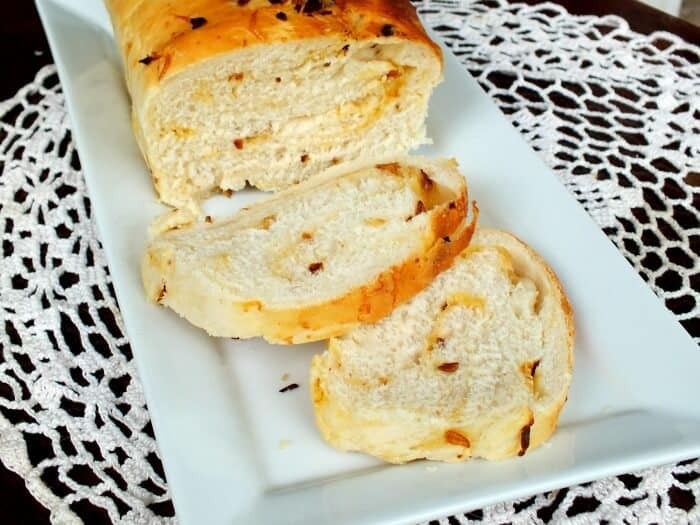 This onion cheese bread recipe is full of flavor! It’s delicious with soup, toasted, or used to create the best sandwich of your life! You can also shape this dough into rolls – just bake for about 20 minutes. If you love this recipe please give it 5 stars! Savory onion and cheese bread is light with a crisp crust, tender crumb, and great onion and sharp cheddar flavor. Try it for your next grilled cheese or ham sandwich. Add the yeast and ginger to the water with a teaspoon of the sugar. Stir together in a bowl and set aside for 5 minutes. Mix buttermilk, sugar, salt, baking soda in with the yeast mixture. Add three cups of flour and mix until smooth. Mix in butter, onions, and cheese until it is totally incorporated into batter. When dough pulls from the sides of the bowl remove it from the mixer to a floured surface and knead until elastic and smooth. Or, knead with the mixer according to manufacturer's instructions. Place in greased bowl, turn to grease the top, cover and allow to rise for 1 -1/2 hours. Punch down and form into two loaves. Brush tops with egg yolk mixed with a teaspoon of water to make it glossy. Remove loaves from oven and allow to cool in pans for 10 minutes. This is a really great bread but it was very dark even on the sides and bottom although I covered the bread as directed. Is there a reason it should be baked at 400 degrees? I think I might try baking at 350 degrees for 40 minutes. This is the first time I’ve ever rated someone else’s recipe. As an avid breadmaker, I always stick to my favorite recipes. 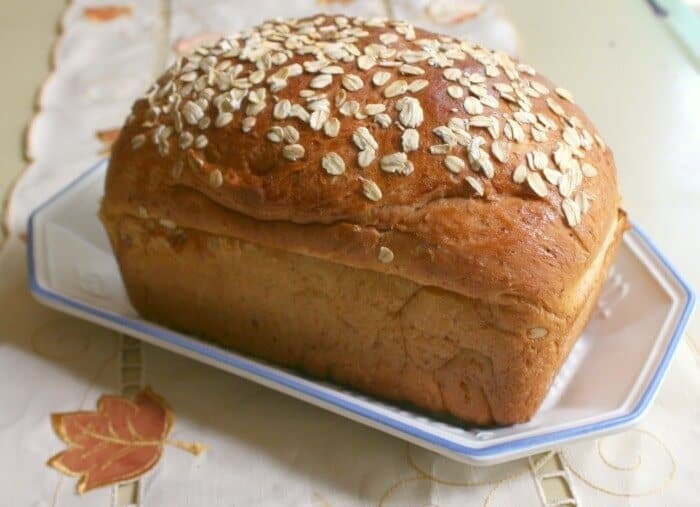 Today I wanted to make onion bread and found this recipe. It is wonderful and our new favorite. The onion is very flavorful and you can still taste the cheese. My husband asked if I made two loaves because he said he was sure one loaf would be gone by the end of the day. I am so, so glad I stumbled upon your Onion Cheese Yeast Bread recipe! I’ve recently started baking again and wanted a bread that called to my hankering for a perfect grilled cheese sandwich to go with my tomato soup. The hardest part was caramelizing the onions and using them to make the bread. Thank goodness I made a double batch. The recipe came together nicely and before I knew it my house was filled with the heavenly aroma of bread baking in the oven. I took a loaf to work to share during a meeting. There was a toaster available in the meeting room and before I knew it the bread had been toasted, distributed and devoured in short order. This recipe rocks! I had to go out of town a couple of days later to visit family and the night before my trip I actually baked 2 loaves to carry home. Again, this bread earned rave reviews. Thanks so much! I do love that one… The Bacon bread makes good grilled cheese, too! I am planning to try it after Thanksgiving is over. I love bread !! These sounded so good.